I’m Alex Smith, welcome to Radio Ecoshock this week. URGENT: I NEED YOUR HELP! I need your financial support. The Ecoshock bank account is getting very low, and I will have bills to pay all through the coming holidays. I particularly need more monthly membership supporters. If you can afford $10 a month to keep Radio Ecoshock (and me!) going please check out this page and sign up. I only need a few dozen supporters to keep this program going out free to people all over the world. If you prefer a one-time donation of any amount, that’s great too. allow fundraising for independent producers. I guess I’m supposed to be part of some big think-tank, or organization. But then I’d have to censor Radio Ecoshock to fit their policy, or try to sell you on their agenda. Please help me stay independent and free to take on the world! and so I’m asking for your help now. Please take a few seconds, and a few bucks, to help me keep going. Otherwise, Radio Ecoshock could go off the air. NANCY LAPLACA: WHO IS KILLING SOLAR IN AMERICA? In May of 2013, we asked energy activist Nancy LaPlaca why the sun-drenched state of Arizona burned so much coal. That hasn’t changed. You can download or listen to that interview here, or read about it in my blog here. Nancy has moved to North Carolina, where she’s helping uncover a national plot by big power companies to slow down solar power in America. She’s working with two activist groups: NC Warn (Building people power for climate and energy justice) and Climate Voices, the science speakers network. You can find that document from the industry group “Edison Electric Institute” online, free, here. Here is an excellent article, “Blocking the Sun” from the group “Environment America”. It names names of the industry groups and big energy companies organizing to make it harder or more expensive for Americans to install rooftop solar. It’s happening in Australia too! What are we talking about? Mega-energy corporations are trying to protect their big investments in dirty power plants, and their virtual monopoly on our energy system. It’s a blow against democracy, where you can choose your own clean power. In some states, big corporate lobby groups, like “Alec” – the American Legislative Exchange Council – “help” states to write laws and regulations that penalize rooftop solar. In some states, they even charge people $50 a month if they install solar and go off-grid! Behind it all, and behind industry groups like the Edison Electric Institute, are a mix of billionaires like the Koch Brothers, and giant energy companies like Duke Energy. billions in these fossils, and can see their market evaporating as people and communities make their own power from the wind and the sun. They know their products will wreck the Earth’s climate for all coming generations – but hey! it’s the stock price and profits the Quarter that really matter to them! It all reads like “Mr Burns” from the TV show “The Simpsons” when he blocks out the sun, to increase profits for his nuclear plant. Nancy LaPlaca describes how it all works. One of the almost unknown ploys are the so-called “Public Utility Commissions” that can set rates and regulations. There is nothing public about them, and the public hardly knows these Commissioners exist, even though they make decisions worth many billions of dollars. In most states, Commissioners are not elected, but appointed by the State Governor. Guess who then gets huge contributions to their next campaign? It’s a shadowy operation at best. In North Carolina, for example, meetings of the Public Utility Commission are not available online or by video. You have to physically drive there and attend if you want to know what is going on. Of course, you probably won’t be allowed to speak or ask questions. The results are generally already decided, after local big utilities tell them what they want. Solar is upsetting all that. “Sunlight is the best detergent“. Find Nancy on Facebook here. This is Radio Ecoshock, covering what the mainstream media leaves out. We are often ahead of breaking news. On September 30th I interviewed Neela Banerjee from InsideClimate News about their investigation into Exxon/Mobil. That company was warned by their own scientists, starting in the 1970’s, that their products would generate dangerous climate change. In the 1990’s Exxon funded groups specializing in sowing doubt, or outright denial of climate change. Now two months later the Attorney General of the State of New York is investigating Exxon/Mobil. The state wants to know if the world’s largest oil and gas company misled the public and shareholders. You heard it hear first. Read that show blog “Criminal Activity” here. Or listen to my interview with Neela Banerjee here. You can watch that full statement (8 minutes) on You tube here. ANDREW NIKIFORUK: YES FRACKING IS POLLUTING SURFACE WATER – AND WE CAN PROVE IT! The heroine of this book is Jessica Ernst. She worked on projects for the oil and gas companies for more than a decade. 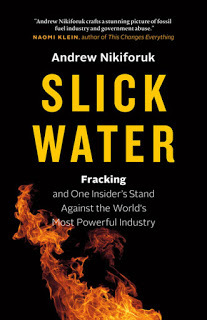 She’s in insider who went along with the game – until her home near Rosebud Alberta was surrounded by noisy fracking rigs. The frackers were after “coal seam methane”. There are various types of rocks that can hold bubbles of methane (known as “natural gas”). The coal seams are very fragile rock, and tend to be closer to the surface. That makes them difficult and dangerous to frack – but profitable too. Jessica was getting all kinds of complaints from ranchers that their water was now laced with methane. Her own well was polluted. But not Jessica. She’s continued a ten year suit against the companies, mostly paid for out of the last of her savings. She is determined to get this fracking pollution into the court records, and keep it all public. That’s very brave. Other local farmers wanted her to settle because they got money for the use of their property. At one point, secret police – from the Royal Canadian Mounted Police terrorism squad, arrived at Jessica’s house. They were told she was a terrorist. They demanded the names of all the ranchers who had complained. Of course she refused, and hosted the plain clothes cops on her porch, in metal chairs, in the Alberta winter. They went away empty handed, after apologizing. So who sent them? As always, you can download or forward these interviews, as separate mp3 files, using links in this show blog. I’ve had an on-going discussion about solutions with Albert Bates. Regular listeners heard his talk and interviews at the recent Permaculture Convergence in London. Here is an excerpt from another talk with Albert, where I ask him about the mystery of our longing for news of the collapse, and the real meaning of a permanent culture. I ask Albert to help me with a problem. If I do a Radio Ecoshock show covering how bad things are, we get twice the downloads of a program with positive solutions like permaculture. Why is that? Bates says most people know, in their heart-of-hearts, that our fragile complex civilization is not sustainable, for a number of reasons. They expect it could, or will, collapse. So when a Radio Ecoshock program has experts pin-pointing those tipping points, and the big-picture risks, it actually helps listeners to formulate what they know for themselves. It’s kind of a relief to know it’s not just you worrying about the future. I love that Bates doesn’t sugar coat it. I think part of the difficulty is people can’t grasp what permaculture is. It’s hard. Albert teaches this subject in workshops around the world. What the heck is permaculture? His explanation is clear, I think. could we live decently for a thousand years? For me, that’s what permaculture is. Lately I’m hearing of permaculture economics, maybe permaculture psychology. Can the definition of permaculture grow so large that it’s core gets lost? Albert says “no”. In fact, the Australian originators of permaculture soon realized this needs more than a different kind of agriculture, or even food systems. The root of many problems is in our society, and we need “social” permaculture as well, and economics that don’t endanger the planet or the future. Stay tuned in the coming weeks, for more of my discussion with Albert Bates, former environmental lawyer turned permaculture teacher, at the intentional community “The Farm” in Tennessee. Keep up with Albert at his blog “The Great Change“. Next week, I’m scheming to bring you a devastating report on the lies we tell ourselves about climate change, as world leaders prepare for the Paris climate talks. It’s harsh news that need to be told. I’m Alex Smith. Thanks for being brave enough to listen, and for caring about our world. Please don’t forget to help me keep going! Wow, that government-supported harrassment the woman fighting against the fracking suffered sounds really scary. Reminds me of mafia methods, or of how things worked when I was very young and my country (East Germany) was a dictatorship with an over-eager state security apperatus. She's lucky things aren't so bad (yet) that she'd actually get arrested as an 'enemy of the state'. But, you know… slippery slope. Good thing you got rid of Harper. I had a positive experience regarding permaculture a few days ago. Real, one of our national run-of-the-mill supermarket chains (think Tesco, not Whole Foods), actually advertised some of its vegetables on sale as "produced with permaculture". Not organic, or "bio" as it's usually called here, but they literally used the German word "Permakultur", in large showy letters. Now, I don't think this actually means that the farm that produced the vegetables is very permaculture-oriented – probably they just use one or two techniques like cover cropping in the winter or making some of their own compost. It's highly likely that they just use the term "permaculture" as a buzz-word and because the farm doesn't actually qualify for any of the government-regulated organic certifications. But it still shows that the concept of permaculture is trickling through to the mainstream customer and getting enough good press that the supermarket thought it was worth advertising the produce with that term. Considering how unknown the whole subject was here just a few years ago, and considering that there's no official government support or big commercial interest behind permaculture and so there's no marketing campaign, I think that's a small victory already.